Please send me more information on Sun Cat Catamaran! Pez Gato is very proud to announce the newest addition to our fleet, the Sun Cat! 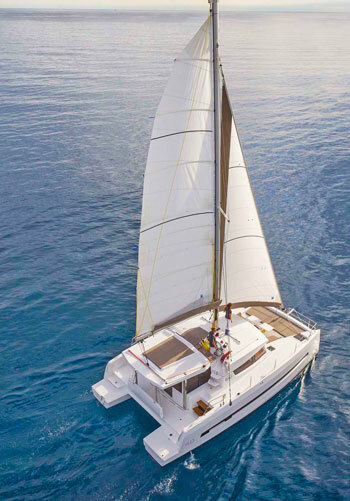 Available for whale watching, snorkel tours and sunset cruises, the beautiful 40-foot Sun Cat is a spectacular catamaran that’s the perfect vessel for enjoying the magnificent sights of the the Los Cabos coastline. The Sun Cat is designed for discerning clients who demand only the best. Equipment: An immense folding rear glass door opens to create a single cockpit/saloon area. A forward cockpit serves as a dining area as well as a sunbathing area. There is also an extra lounging area on the coach roof, 3 interior suites and a full bathroom. Four-hour tour to either Chileno Bay or Santa Maria and includes all snorkel equipment, open international bar and snacks (guacamole, chips and salsa). Whale watching tours run from mid December through March only. This experience is not to be missed. The tour sails into the Pacific Ocean and the Sea of Cortez in search of Baja's gentle giants who make their way along the coast during their annual migration. Includes open international bar and snacks (guacamole, chips and salsa). A 2-hour coastal cruise that includes an open international bar and snacks (guacamole, chips and salsa). Note: Cost of dinner menu is not included. Please contact us for rates and to customize your menu. A 2.5-hour coastal cruise that includes an open international bar and snacks (guacamole, chips and salsa). Please contact us for full description of menu options. All menus must be scheduled in advance and are to be paid directly to Sun Cat. Transportation is not included but, can be added from select locations at $18/person + tax (fee is to be paid directly to Sun Cat). Prices quoted include IVA/sales tax, port charges (if applicable). All tours depart from Dock #4, between the Dolphin Center and the Cruise Ship Pier.